Home Body	Biohacking the microbiome in my gut. What’s the effect? Biohacking the microbiome in my gut. What’s the effect? In my new-geeky-biohacking-friend-group a product called Restore came across. Kasper van der Meulen, teacher at the Wim Hof Academy, and someone who impressed me a lot while attending one of his Advanced Wim Hof-workshops used it already. So, I searched the internet, got some additional information from Kasper and decided: ‘I want to try this!’. But next to using Restore I wanted to sample my gut bacteria first to use it as a baseline. So I can re-sample after using Restore for 2 months and get more insights on the actual effects and/or benefits of Restore. In Europe I couldn’t find an institute that could sample and sequence my bacteria. 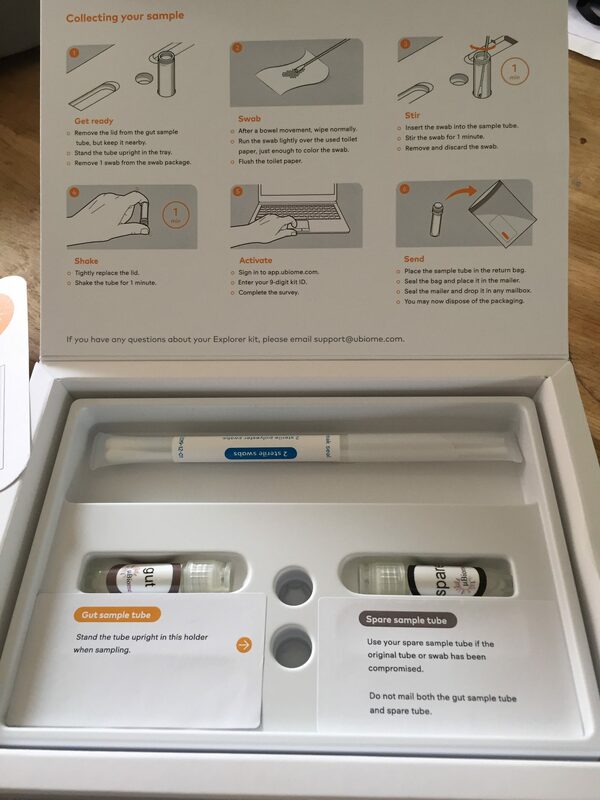 So I ended up ordering a Microbiome Explorer kit for citizen scientists from uBiome in the US. And than the curious, playful kid in me really awakened. and a spare gut sample tube (in case the original got compromised in anyway). From that moment on I felt like an actor in a CSI-scene. Dusting and fingerprinting the crime scene, making sure nothing gets compromised or otherwise you loose the case due to contaminated evidence. Most likely I was distracting myself because the scene in this specific case felt a bit personal and awkward at the same time. A bit of a scientific, playful approach helped me overcome my embarrassment. There I was swiping the sterile swab across the corresponding site, inserting the swab into the sample tube and stirring for a minute. 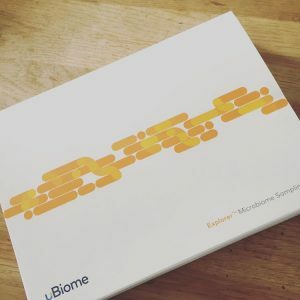 I had to activate my sample online and sent it back to uBiome. And than the hard part started. Be patient and wait for the baseline results. For more information on Restore I suggest you check out their website. Last week I received a notification that my data is available and of course I like to share these with you. I will just share my data, but no interpretation, as this a new area of science and too little data yet for any main conclusions. Am curious though to compare these first results against the results of the second sample. Biohacking the microbiome turns out to be a very interesting experiment and a pragmatic way of increasing my knowledge on the bacteria in my body. First of all if we look at the ratio of Firmicutes and Bacteroidetes*. 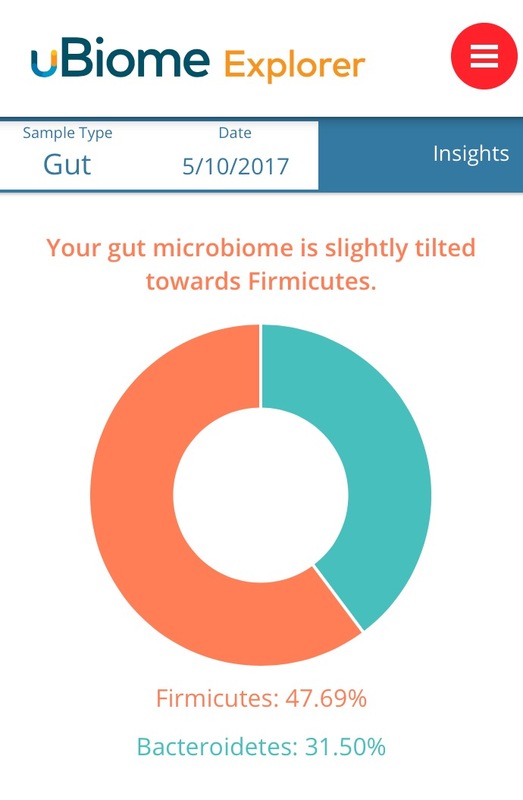 My gut microbiome is slightly tilted towards Firmicutes. And Akkermansia bacteria are not showing in my sample. * Bacteroidetes are the most prominent gut microbes in much of the world. They are thought to help protect against obesity because they do not digest fat well. Firmicutes help us to digest fat that our bodies need for energy and are among the most common microbes in our gut. Although an oversupply of firmicutes has been linked to a higher risk of obesity, historically these bacteria helped early Europeans survive harsh winters. Akkermansia Muciniphilia, is the subject of intense research due to its apparent association with obesity, diabetes, and inflammation. It appears to survive on the mucin produced by the cells in the intestinal wall (source: uBiome website). The two genera of bacteria most commonly found in probiotic supplements (they are also naturally occurring in your gut) Bifidobacterium and Lactobacillus do not show up in my sample. * Bifidobacterium are among the most well-studied organisms in the human colon, as they are believed to play an important role in life-long health. Because of their usefulness, many species are sold as over-the-counter probiotics, though there is limited data on their efficacy. Lactobacillus bacteria populate the entire length of our digestive tracts and play a major role as probiotics, keeping potentially infectious germs at bay while helping healthy microbes thrive (source: uBiome website). 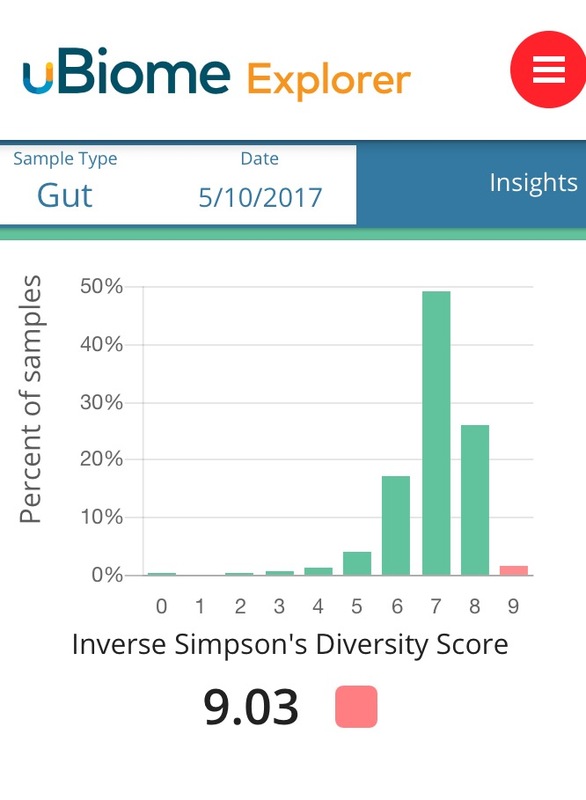 My bacteria compared to all samples of the same type (people who report no ailments and high levels of wellness) in uBiome’s microbiome database gives me a score of 99th on diversity percentile on the Simpson’s diversity index. This means 99% of all gut samples in the database are less diverse than my sample. * Greater microbiome diversity has been correlated with good health, but diversity can vary greatly among healthy individuals (source: uBiome website). The number of very elusive bacteria (found in <5% of all samples) in my baseline-sample is: 10. The ten rare bacteria in my gut are reflected in the picture to the left. 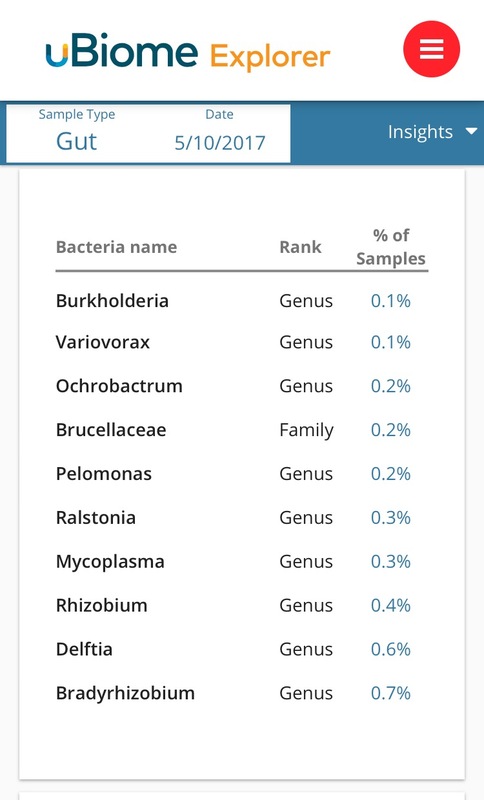 Burkholderia is apparently the most uncommon bacteria in my gut. Curious as I am, I immediately googled it and it turns out to be related to horses. As my oldest daughter is an avid equestrian, I don’t think it’s strange. It is fascinating stuff! Seldom seen bacteria are less likely to have been studied in depth, but the rarity of these specimens does not indicate they are beneficial or harmful (source: uBiome website). To really understand the impact/effect of using Restore on the microbiome in my gut I must re-sample my gut-microbiome again. But yesterday I received a message from uBiome that there is a backlog due to an unexpected increase in orders and the shipment of my Gut Explorer kit is unfortunately delayed. So instead of 2 months I’m going to use Restore for 3 months now, because I had to sample myself tomorrow to make the 2-month period. Furthermore I learned with the first sample, it takes almost 6-8 weeks after sampling to get the results. So it will take at least 2 more months before I’m able to make the comparison for this biohacking the microbiome project. But I’m really excited and wanted to share the results of the first sample already, so therefore I’m publishing this blog already. Once the comparison can be made I shall update this blog. If you are doing some similar experiments or have some feedback on my approach. Feel free to drop a comment. Be curious and playful in the meantime. Just came across your blog by googling ….I just got my results back and have been trying to interpret them. I was pleased to find your blog and am curious as to what your next results will be. (After using restore) I am curious if this highly expensive product is worth it’s money in gold lol! I guess the question is ….do you suffer gut issues at all? That is what led me to get the kit in the first place. The overlap between your sample and the average microbiome among Selected Samples? I am trying to figure out if the higher the number the better? LOL! I am still trying to break mine down and figure it all out. I have learned a lot from it and know I have to make some changes to iMprove my gut health. I was battling a bad bacteria in my gut for years and I am thrilled to say it is gone – I am not on the rebuild stage ! Well I had to check my Wellness Match again and it is 90,8%. 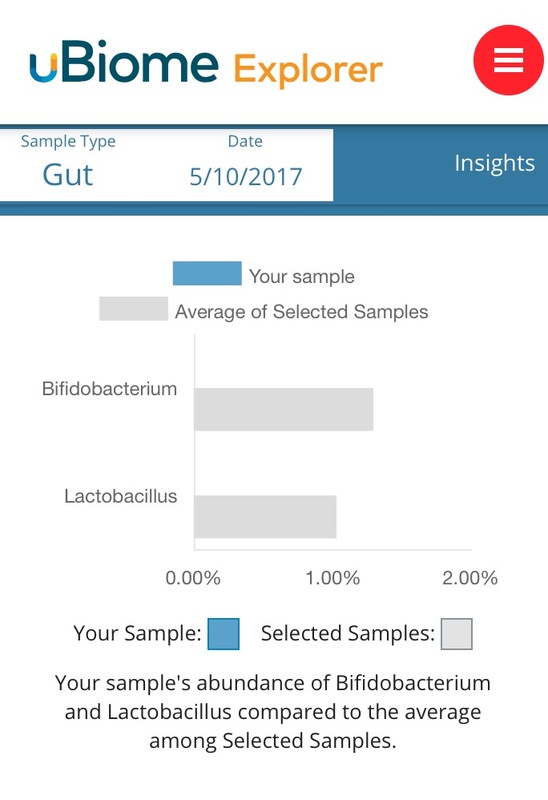 For other readers: Wellness Match is the overlap between my sample and the average microbiome among Selected Samples. And I compared (Selected Samples) myself to samples from individuals who report no ailments and high levels of wellness. So I am actually quiet curious now what your Wellness Match is? Bear in mind this Wellness Match is prior to taking Restore, so hopefully it increased even further and I hope I have some more unique bacteria in my next sample. I quickly checked the status at uBiome and they are still processing it. On Restore, I don’t use it anymore. I was actually quiet astonished with the outcomes of my first sample set (better than expected). So I first await the results of the second sample. And while waiting I started some other experiments like PlantParadox. I’m actually three weeks on the ‘Intensive care program’ now :-). It is fun sharing these experiences and insights so if you have more questions shout.